BERLIN – Several months of renovations culminated with a grand opening of Berlin’s newest art gallery last week. On Aug. 28 Art in the Fields opened at 6 S. Main St. to a crowd of local residents and town officials. The gallery is home to more than 50 pieces of modern art. Williams and other town representatives joined owners Foster and Lisa Schoch for a ribbon cutting in front of the gallery as it opened its doors to the public for the first time. Many of those present were eager to see what the couple had done with the interior of the gallery, which was formerly Mid Atlantic Pain Management. They were greeted with gleaming wood floors and white walls covered with the colorful work of Andy Warhol and other modern artists. According to Kelly Lehman, gallery manager, in its main room Art in the Fields will feature a different artist each month. The well-known Campbell’s Soup and Marilyn Monroe prints of Warhol’s are on display now and will be followed by an exhibition of work by Erte, an artist and fashion designer. Ilya Bolotowsky will be featured after Erte. Williams said he expected the gallery to be a good addition to the Berlin Arts and Entertainment District. Lisa Schoch said she’d been thrilled with the amount of community support she’d received for the gallery since she and her husband first announced plans to open it. “We have had a lot of people who said they liked what they saw,” she said. She said many of the exterior improvements the building was subject to were funded with the help of a façade grant. 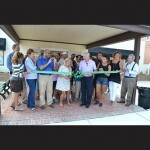 The grant helped pay for new awnings for the building as well as renovations to the portico. “There are still some touches outside we need to work on but we wanted to get the doors open,” Lehman said. “We’re just happy to be able to share our art with the community,” she said. All of the pieces on the walls at Art in the Fields are for sale. Permanent hours for the gallery have not been set yet, but Schoch said she expected it to be open from noon to 4 p.m. most days of the week. Larnet St. Amant, director of the Berlin Chamber of Commerce, said she was pleased to see the hard work of the Schochs and Lehman pay off last week with the opening of the gallery. She added that it would provide visitors with an added attraction in Berlin. “It’s another thing for tourists to do to spend some time in Berlin,” she said. 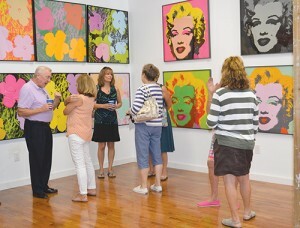 For more information on the gallery visit www.artinthefields.com.